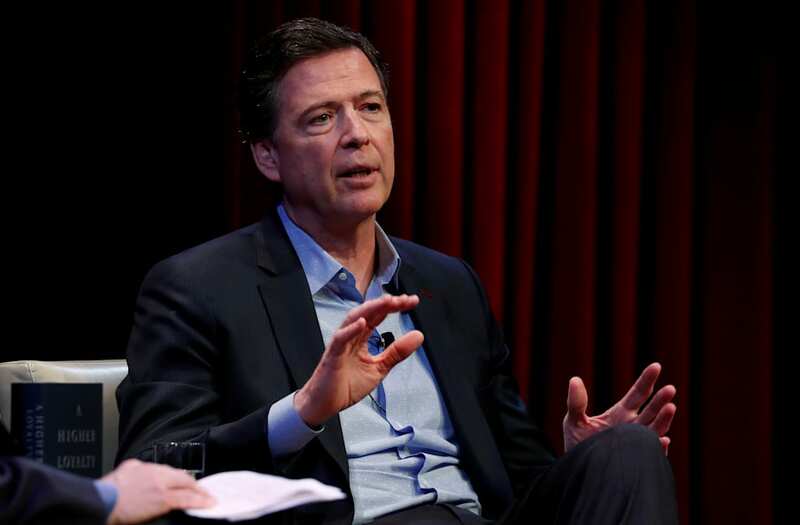 Former FBI Director James Comey responded on Monday to President Donald Trump's multiple suggestions that he should be jailed and shared how he'd prosecute Trump. Comey doesn't think much of Trump's suggestions that he should get jail time for his handling of investigations into Hillary Clinton and the Trump campaign. If Comey were prosecuting Trump, he said he'd let him know that any failure to tell the truth would come at his own peril. Former FBI Director James Comey responded on Monday to President Donald Trump's multiple suggestions that he should be jailed and said the president he should submit to questioning by the special counsel Robert Mueller, who is investigating Trump's possible collusion with Russia. "It is hard in almost all investigations to imagine getting to that without some interaction with the subject," Comey said at an event presented by and reported on by the news website Axios. "But whether [Mueller] gets it or not, I hope he's free to get to the truth." Comey's comments come after The New York Times published what it described as an outline of the 49 questions Mueller would ask Trump in a hypothetical interview. Mueller wants to know what the president had in mind when he tweeted about Comey, the attorney general Jeff Sessions, and deputy FBI director Andrew McCabe, according to The Times. "In a normal world, it would be very hard for the President of the United States not to submit to an interview in connection with an investigation that touches upon ... his conduct and that of people around him," Comey said. "In a normal world, the American people would find that very, very difficult to accept." But after commenting on how proceedings would go in a normal world, Comey conceded that "we don't live in that world," citing norms being broken that "that disturb me greatly." "On a regular basis, the president tweets that I should be in jail, and even I go, 'Eh,'" Comey said with a shrug, according to Axios. Comey, a prosecutor himself, had some insight into how Mueller should investigate Trump. According to Comey, Mueller should demand unlimited time for unlimited follow ups, even as the dragging investigation riles Trump on the regular. Secondly, "I'd want to make sure there was a clear understanding on the part of the subject of the interview that, whether or not it was within the grand jury, still a false statement would be prosecutable," Comey said. "Those would be the key things: open-ended as to time; open-ended as to subject; and a clear understanding that you are obligated to tell the truth, and failing to do so will be at your peril," he continued. Trump has at times said he would submit to an interview, but in March laid out the conditions that he would only do so if Mueller could promise an end to the investigation within 60 days or limit himself to a narrow set of questions.